The “Caught in the Act” program is designed to recognize notable acts of service excellence for which an individual or a team goes out of their way to exceed the expectations of a patient or staff member. In December, two staff members were recognized for going above and beyond in support of service excellence. Thank you, Lauren, for going above and beyond for all of your patients, and for demonstrating what it means to provide patient-centered care. ﻿﻿Eric Husband, BMSc (R), knows hospitals can be scary places, and despite the excellent care we provide, few patients look forward to visiting. The anxiety of undergoing a radiologic exam can be daunting. 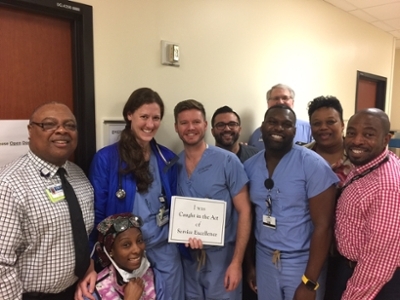 Fortunately, Emory Radiology has champions of service excellence like Eric working hard to quell fears and anxiety for patients and create lasting memories with them. Eric is regularly mentioned in Press Ganey and often requested by name because of his energy and the service he provides to them. Often described as kind, considerate, funny and engaged during all of his interactions, he has proven to be a remarkable asset to our department and Emory Healthcare. Thank you, Eric for providing excellent care to our patients and for keeping us all smiling.